When KCC first purchased the land for its current campus in 1941, the area was part of the rural landscape along Highway 69. Decades later, the college’s home at 74th St. and Metcalf Ave. in Overland Park, Kan., is now part of a thriving Kansas City suburb filled with businesses and charming residential communities. The once country highway has become a major thoroughfare over the years, leaving KCC in a prime, convenient location. The KCC campus is made up of six primary buildings. Cowen Memorial Auditorium (7020 W. 74th Street) houses the KCC business and administrative offices as well as an auditorium/gymnasium. The 20,000-square-foot Palmer Education Center holds classrooms, additional offices and the library. Just across 74th St. sits Shaver Hall, which includes student dorm rooms the cafeteria, apartments, student lounges and laundry facilities. The Administration Building provides adminstrative and faculty offices as well as financial aid and recruiting offices. The old chapel building includes college classrooms faculty offices and student center as well as a piano studio and practice rooms. A limited number of on-campus faculty and staff residences are also located on the property. In addition to our buildings, KCC owns a large green space that is used for a variety of sporting activities including soccer, softball, track and more. 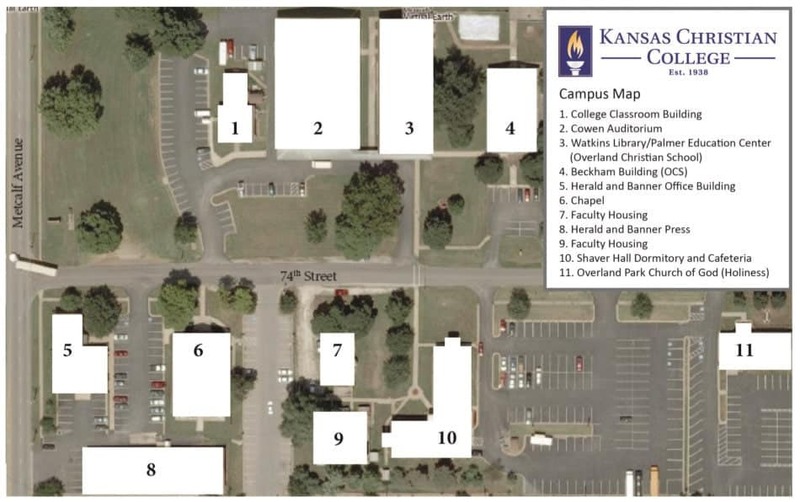 The KCC campus is easily reached by I-35, I-435 or I-635. From I-35, take the Metcalf exit and travel south for approximately two miles to 74th street. From I-435 on the south side of the metro, take the Metcalf exit and travel north to 74th Street. From the north and KCI Airport, use I-635 South, which will merge into Metcalf Avenue; then travel south for two miles to 74th street. The campus also is located along the Johnson County bus route with a permanent stop within the block. Dining services are provided by Pioneer College Caterers, Inc. Pioneer serves faith-based campuses exclusively throughout the United States. Its mission is to provide students with the highest possible quality food at a reasonable price. Parents and friends of resident students can send a special occasion snack, cookie, or cake.